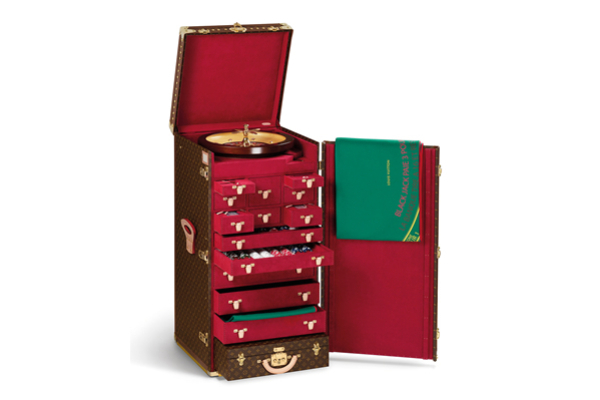 WHAT This is a special creation, made specifically for people who want a custom Louis Vuitton case to carry something special like a guitar or their mother’s homemade apple pie, a baby bottle holder or a hair dresser’s trunk, or the famous Baroda tea case. With a specific concept in mind, you can sit with a brand representative (expect four-five meetings) and arrive at a sketch of the product you would like created. It is most likely based on something you have seen. You can then select the leather or canvas and choose the inside lining. Certain styles are non-negotiable. What that means is that certain styles can only be customized within boundaries, for instance, the Monogram canvas with gold fittings is linked to natural leather handles. WHERE The order can be placed in any Louis Vuitton flagship store. HOW One craftsman in France works on this piece from start to finish, and it can take up to six to eight months to complete. WHAT It is a selection of products out of the Louis Vuitton permanent collection which are available for order in a selection of predefined exterior materials and interior linings. Any available product can be customized to some extent within the listed options. WHERE The order can be placed in any Louis Vuitton store. HOW This would take 1-3 months to complete. WHAT You can get a personalised ‘stamp’ on luggage tags, bags and wallets (depending on the style and material), at the time of purchase. PRICE There is no cost involved. WHAT You can create a personalised monogram within the Louis Vuitton template. There are options designed according to the style of the bag. This can be done with initials as well. They are generally vertical stripes of varying colours, taking off from how royal families have their own colour codes. WHERE This is done on a few predefined products before purchase. You can use the computerised simulation app at a flagship store. HOW This takes six to eight weeks to get done and the colour won’t scrape off. The application will also give you the exact delivery date and time once you are done making your choice. PRICE There is an additional cost for this. WHAT You can get your bag hand painted. HOW This can be done at the time of, or even after purchase, though the latter depends on the condition of the canvas.